With all the crops, there have to be large numbers of places to plant them, and there certainly are. This section of the guide will explain about all the different Patches, what's good about them, what's bad about them, and lots of other things that you may find useful. Location: The location of the patch will go here, along with a map when you click on the name. Type: The type of Patches that are available will go here. 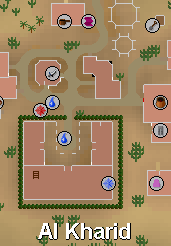 Nearest Teleports: The nearest Teleports will go here, along with a note about which Spellbook the Teleport is on, or if it is something such as Jewelry. Nearest Banks: The nearest Banks to the Patch will go here. Helper: The name of the Helper will go here, along with a link which will display an image of the NPC. Pros: All Patches have something good about them to put here! Cons: All Patches have something bad about them to put here! 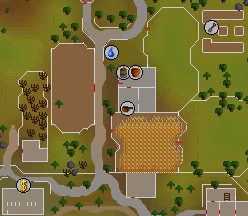 There are four main Allotments around RuneScape, each with two Vegetable Patches, one Flower Patch, a Compost Bin, and a Herb Patch. There are also two other 'Allotment' Patches, one with just a Vegetable Patch, and one with a Herb Patch that can never become diseased! Pros: There are numerous different ways to easily access it. It is near to several Banks. Cons: You have to travel a small distance to get to the nearby Farming Shop. Pros: The Farming Shop is very near. 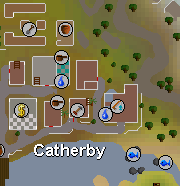 Catherby Bank is nearby for Banking. Cons: There are often people standing around who may get in the way when trying to plant Seeds. Pros: There is a Cabbage field next to the Allotment, so it's easy to get payment for Tomatoes. Cons: You have to climb over stiles and open gates to get to it. 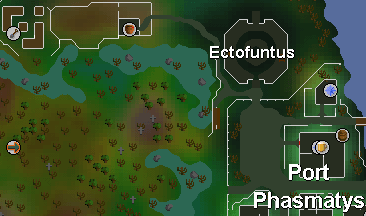 Pros: Isn't very far from the Ectofuntus if you use an Ectophial to get to it. Cons: Requires you to complete Quests to access, and even more to be able to get to it quickly. Helper: There is no Helper to watch your crops here. Pros: It is another Patch. Cons: It's in the middle of nowhere. There is no Helper to watch your crops. There is only one patch for Vegetables. The patch is surrounded by aggressive Zombies. You need to do large numbers of Quests to get to it. Even if you have done these Quests, it's rarely worth using since it's a very long way to go unless you are on Mos Le'Harmless for an activity such as Trouble Brewing or Cave Horror slaying. Pros: If you plant Herbs here, My Arm will watch over them, making sure they don't die without you having to pay him. This makes it good for plating expensive seeds such as Ranarr and Snapdragon. The Tool Leprechaun is sitting on a Deck Chair! How much more awesome can you get? Cons: It's a remote place. You need to do a number of Quests to be able to use the patch. As with the Allotments, there are a number of different places that you are able to plant any Hops Seeds you may have lying around in your Bank. 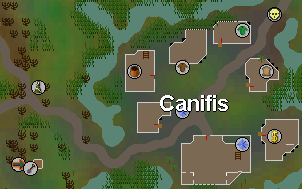 Pros: It can be accessed on the way to the Law Altar if you are crafting Law Runes. Cons: You cannot take any Armour or Weapons to Entrana, so may need to change what you are wearing before heading to the island. Pros: There is a Chicken Pen nearby that you can collect Feathers in. Cons: It's quite a way from any places you can Teleport. Pros: It can be visited on the way to the Coal Trucks Mine. 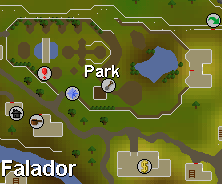 Pros: There are a number of Teleports on Modern Magics nearby. 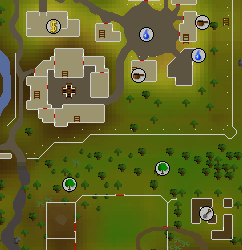 Cons: The Modern Teleports each have requirements such as 50 Construction or a Quest Completed. Once again, there are multiple patches that you can choose between to plant your oh so precious Bush Seeds in! 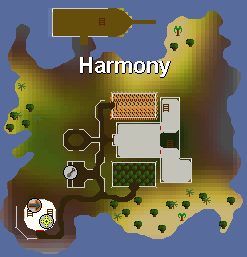 Pros: If Mining at the Monastery, it is easy to get to. 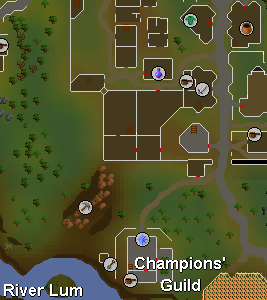 Pros: It's right next to the Champions' Guild, and there are various things to do inside the Guild. There is also a Mine nearby to Mine Ores from. Cons: Unless you have a Bracelet of Combat, it's a bit of a distance to get to. 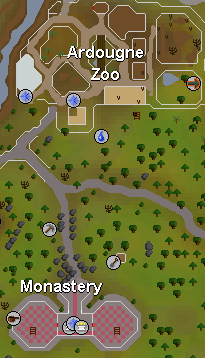 Pros: There is a Spirit Tree Patch nearby that makes getting to the island easy if you have 83 Farming. Cons: Unless you do have a Spirit Tree in the nearby patch, it's a remote place that can be a pain to get to. 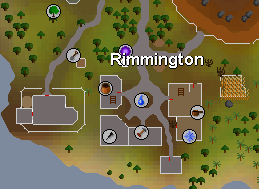 Pros: If you have a House in Rimmington, it's just outside. Cons: If you don't have a House in Rimmington, it's a long way to get to it. These are the Trees that can give experience in a fast and furious manner, so make sure you keep them under control, or they may go crazy, and the experience appearing off them more than you could ever have imagined! 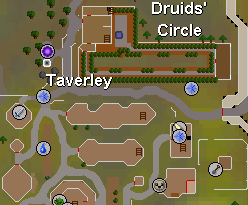 Pros: Is in the middle of Falador, so is somewhere you are likely to go past regularly. There are a number of rows that you can burn Logs from a Tree you cut down. Cons: Due to Mole Holes, no clear rows to burn Logs are long enough to burn a full inventory easily. Pros: There is a Bank very nearby. Not very far away is a Fruit Tree Patch. There are a number of rows that Logs can be burnt down, otherwise Banking them is easy. 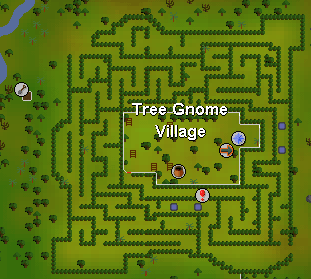 Cons: Unless you have access to the Gnome Stronghold Spirit Tree or the Gnome Gliders, getting to the patch can be hard work. 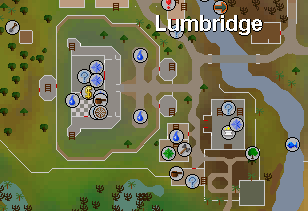 Pros: It is easy to get to due to the fact that it is so close to Lumbridge. There are a couple of places to burn lines of Logs down. Cons: You have to walk a small distance east of the Patch to get enough room to burn lines of Logs. Pros: There are numerous great lines to burn Logs down. Cons: It's a small distance from any Teleports. 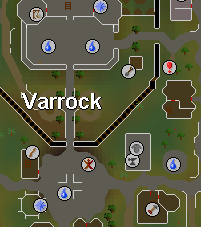 Pros: Is easy to get to with a Varrock Teleport. There are a couple of wonderful lines to burn Logs down. Cons: The graphics in the area may make you depressed. As with Wood Trees, Fruit Trees can pull in masses of experience without you even realizing anything is happening. This makes them another must-visit for any wannabe Farmers. Pros: Can be visited en-route to the Calquat Patch when traveling from the mainland. 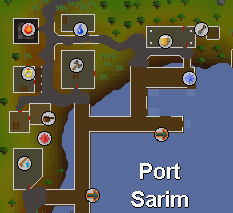 Cons: Either requires you to Teleport to the island or pay 30gp for a Boat trip to get there. 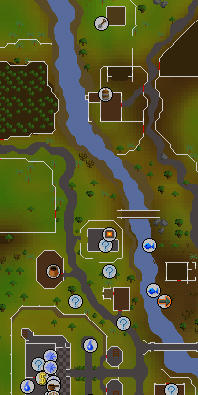 Pros: It's easy to get to if you spend a lot of time Fishing in Catherby. Cons: It's a bit of a walk down the Beach to get to it, although there is a wonderful view out over an Obelisk! Pros: There is a Bank fairly nearby. Not very far away is a Wood Tree Patch. Pros: The patch is very near to where the Tiny Elf Crystal teleports you. Rather than having a Leprechaun, there is an Elf called Teclyn who does the same job. 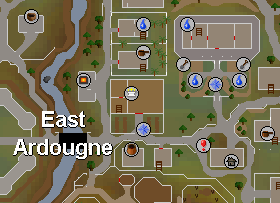 Cons: You need to complete several quests to get to the area. Pros: It's another patch that can give you large amounts of experience. Cons: Can be hard to get to due to it being in a remote location. 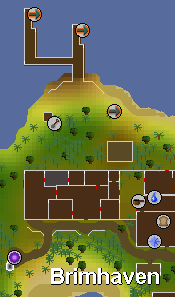 There are three places that you can plant Spirit Trees around RuneScape, and each one has a Gnome willing to protect it for the strange items of a Ground Tooth, a Monkey Bar and 5 Monkey Nuts. It's clear that they're planning on taking over at some point soon, so let them protect more Trees, and make the invasion quicker than it would be otherwise! Strangely, you're limited to just having one Tree planted at a time, so this invasion will inevitably be slower. 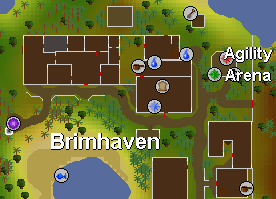 Pros: It's easy to get to if you are planting a Fruit Tree in Brimhaven. Cons: There isn't much use for it in Brimhaven since there isn't much around, although there aren't any other very close Teleports. There is no Toll Leprechaun here, so you'll have to go to the nearby Fruit Tree Patch to find one. 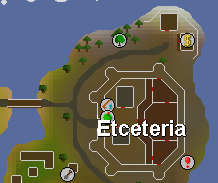 Pros: It gives access to Etceteria that can only be dreamed of otherwise, and is near to a Bush Patch. Cons: It's a long way to go to Plant it, then Check its Health in the first place, before you can use it to get to the island. 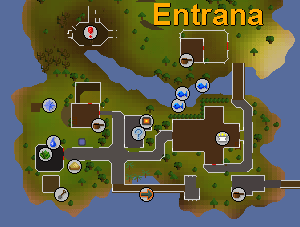 Pros: Can be visited en-route to either the Falador Allotment or Entrana Hops. 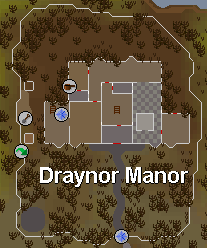 It's a Teleport slightly nearer to the Rimmington corner of the Freeplay World than Draynor Village. Cons: Other than Pest Control, there isn't much to do in that corner of the world. 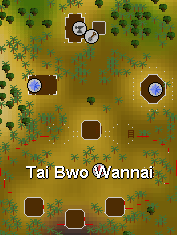 There are just a few other Patches in RuneScape for Special Crops that are so amazingly special that they just had to be called 'Special', which must have been a highly special feeling for them on the special day that they were named in the special naming ceremony. 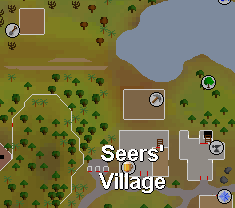 Pros: This is the only place to grow Evil Turnips and it only takes about 4 minutes for them to grow. Cons: Unless you have several to plant and something to alch while waiting, getting to the patch can seem like a lot of hard work. Pros: You can grow Nightshade to make Poisons from. Cons: If you aren't wearing Gloves when you try to pick it, you will get poisoned with a Poison that hits two damage. Pros: The Spines are used to pay a Helper to watch over Yew Trees. 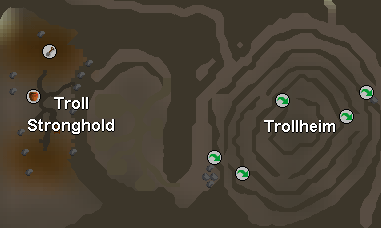 It's fairly near to the Ring of Duelling Duel Arena Teleport. Cons: The Banks are quite a distance away. Pros: The experience from the Tree is amazing for the price of the Seed. Pros: It is very near to the Fairy Ring. Cons: Other than the Fairy Ring, access is very limited. Pros: It is the only Jade Vine patch there is. Cons: You must have completed the Back to My Roots Quest to use it.